Fire Hawk Video Slot Guide & Review - Casino Answers! Fire Hawk is a 5-reel, 25-line video slot found at Vegas Technology and Random Logic casinos. For the purposes of this review, we will be reviewing the game as found at Vegas Tech casinos. 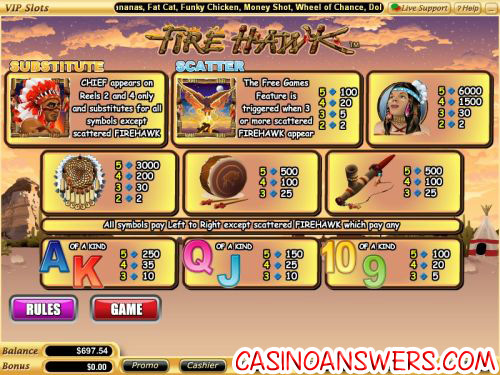 Fire Hawk features a wild symbol, scatter pays, multipliers and a free spins feature. You can play the Fire Hawk video slot at US-friendly Vegas Tech casinos such as Silver Dollar Casino or non-US Random Logic casinos such as Supro Casino. 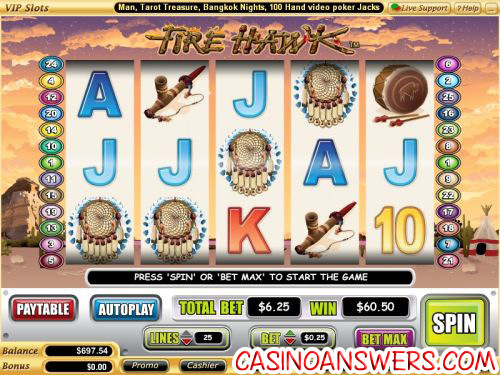 To play the Fire Hawk video slot game, set your bet at $0.01, $0.05, $0.25, $0.50, $1, $5 and $10. You can change the number of active paylines from 25 if you want. The lowest total bet you can make on the Fire Hawk slot machine is $0.01 with the highest being $250 per spin. When you are ready to play Fire Hawk, use the “Spin” button or “Bet Max” to play with all 25 paylines selected. The Chief symbol is Fire Hawk’s wild symbol and appears on reels 2 and 4. It will substitute for all symbols on the Fire Hawk video slot except for the Scattered Firehawk symbol. The Chief wild symbol does not pay out by itself. When three or more Scattered Firehawk appear anywhere on the reels, you will trigger the free spins feature. You will be awarded 20 free spins. If the Chief symbol appears on either the second or fourth reel, you will receive a 2X or 4X multiplier respectively. If the Chief is on both reels, you will receive a 10X multiplier. The free spins feature can be re-triggered. Free spins are played at the paylines and bet of the triggering game. Free spins are added to payline and scatter wins. In Fire Hawk’s autoplay mode, you can select the number of spins (5, 10, 25, 50, 100, 250 or 500), the number of seconds between spins (0.25, 0.50, 1, 1.50 or 2), to stop once all spins are complete, to stop when the jackpot is hit, stop if a win exceeds or equals ($50, $100, $150, $200 or $250), to stop on any win or to stop if credits are increased/decreased by ($50, $100, $150, $200 or $250). You can stop autoplay at any time. All symbols on the Fire Hawk video slot pay left to right except for the Scattered Firehawk, which pays any. Payouts are made according to the Paytable. Payline wins are multiplied by the amount staked per payline. Scatter wins are multiplied by the total bet. Scatter wins are added to payline wins. Only the highest win on each selected payline is paid out. Coinciding wins on different paylines are added. The Chief symbol appears on reels 2 and 4 and substitutes for all symbols except for the scatter symbol. Fire Hawk is not loaded with bonus features or a particularly high top jackpot (although 6000X is still good), but it’s still put together well. It is not our first choice of Vegas Tech video slots, but it’s not our last choice either. If you want to try Fire Hawk, you can get a 100% up to $500 signup bonus with a $5 no deposit bonus for free at Silver Dollar Casino. Where can USA players play the Fire Hawk slot machine? US slots players can play Fire Hawk at Silver Dollar Casino or any other Vegas Tech casino. For more casinos that use the Vegas Tech software, please read our list of Vegas Tech online casinos. Where can non-USA players play Fire Hawk? If you are not located in the United States, you may be better off playing Fire Hawk at Random Logic casinos such asSupro Casino. For more Random Logic casinos where you can play Fire Hawk, please read our list of Random Logic casinos. What special features are found on the Fire Hawk video slot? Fire Hawk has 20 free spins with 2X, 4X and 10X multipliers. If you get two Chief symbols during the free spins feature, prepare for a big win! Can Macintosh gamblers play the Fire Hawk video slot? Mac casino players can use the Silver Dollar Flash Casino Instant Play option. This is also the option for other non-Windows users and ones who don’t want to download the harmless downloadable casino client. If you experience any issues using the Flash casino, try re-installing Adobe Flash Player. What is the Fire Hawk Slot Machine Bonus Game?